The Walter family grew by one! Tig (blue boy) went home with them on Friday morning and is doing wonderfully. He’s already learning loose-leash walking, is killing it at potty training, and loves blasting through the doggie door at warp speed. 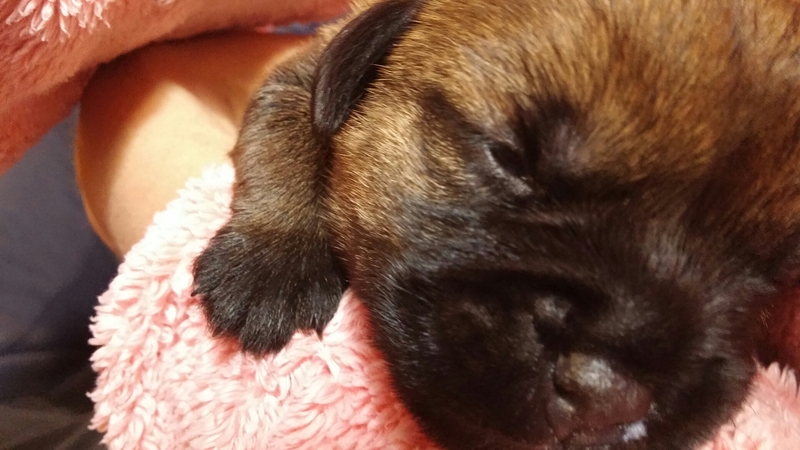 We can’t believe the puppies are 8 weeks old already, where did the time go?! 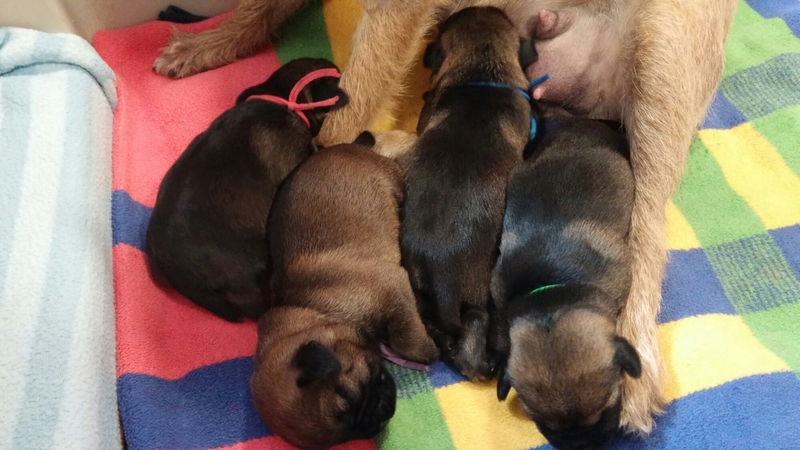 This week we did our evaluation and were blown away by the overall quality of this litter. See the headshots for some glamour! Another milestone was their first vet visit and vaccinations, which went extremely well. We used the homeopathic remedy Thuja as a preventative and didn’t have any issues with vaccine reactions. With the heat wave we tried out a kiddie pool, which everybody dipped their toes into. Blue boy, now named Tig, went home with his new family in beautiful Idaho. We hated to see him go but we sure have loved getting photos and updates all weekend! He’s already settled in and living like the prince that he is. First vet visit was a success! Last photo of the whole litter together! Luckily we’ve had great weather (plus a beautiful new cedar fence!) so the puppies have been able to spend most of their playtime outdoors. They love chasing each other up and down the hills, digging in the dirt, and fighting over sticks. They had their first bath, which Blue loved, and have been spending lots of time playing with Wally and Fiona. Vocal experimentation seems to be their new thing as we now hear the occasional howl floating up the stairs when we first get home from work, and they’re also barking more. Wow, what a busy week it’s been! The puppies are growing more and more adventurous, putting everything in their mouths and trying to play with everything in their environment. They’ve taken a real liking to shoes and love to play with the apples that drop off the tree in our yard. They got to experience a mini “pool”, which brought out the waterdog in Blue. Wally finally warmed up to them and has been playing with them in the most gentle way. It’s adorable to watch! Today the puppies are three weeks old and it’s been a big week for development! With their eyes and ears now open they’re noticing much more of their environment and even recognize us. We’ve been playing background music, starting off laidback with “Relaxation” radio and reggae. They’re playing with each other and practicing “killing” the little squirrel toy. They’ve moved into a bigger pen with lots of toys to explore, including a mirror, raccoon tail, balance disc, and more. It’s a puppy amusement park! This week everybody opened their eyes and, as ears started opening up, found their voices too! Purple is learning to bark and everybody is practicing their play growl. All four puppies are walking (albeit clumsily) and have started playing. Mostly this entails trying to gum a sleeping/eating sibling to death. Red started it a couple days ago but now all the puppies are starting to just crack open their eyes. It’s so exciting to finally “meet” them as they start to realize there’s a big world out there. 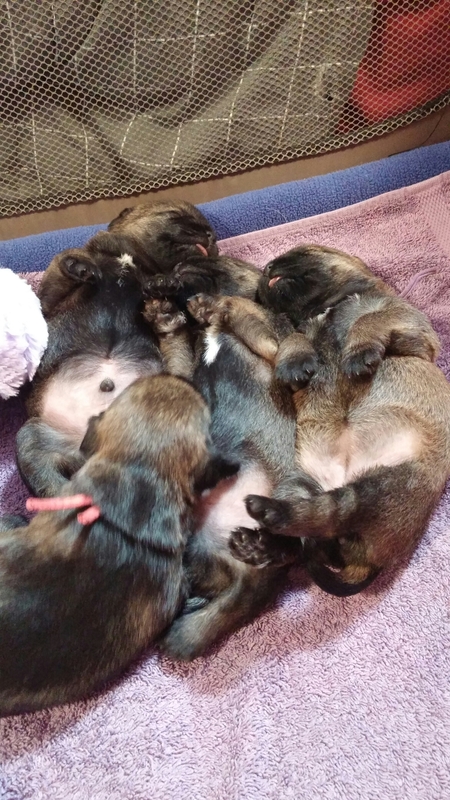 The Scout x Fiona puppies are one week old today and all are doing well. 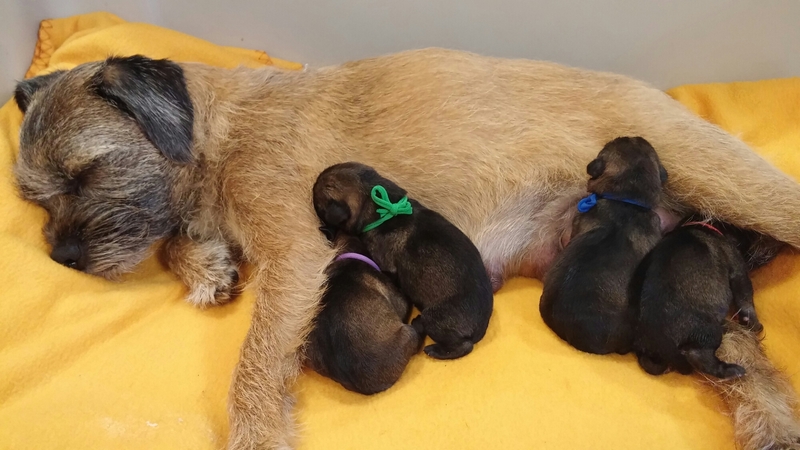 Fiona is doing a fabulous job, proven by the fact that all four puppies have more than doubled in weight since birth! The puppies are being handled daily and have been introduced to several new scents, including raccoon tail, wood, and ceramic. It’s fascinating to watch them pause to take in and catalog each new scent.